If just reading the Bible isn’t giving you the peace and happiness you desire, worry no more! Joyce Meyer claims that with her new book, you will “experience a new level of joy, contentment, and excitement about your life.” 20 Ways to Make Every Day Better will hit store bookshelves on April 4th and there is a sample available on JoyceMeyer.org that includes the introduction and the first two chapters. However, if the sample is any indication of what we can expect from the rest of the book, I’m willing to bet that it is full of twisted scriptures and total nonsense from beginning to end. 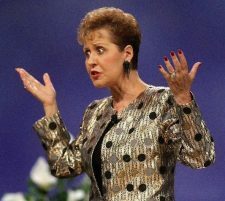 Joyce starts out her introduction talking about the problem with bad days saying, “I don’t believe for one moment that you have to go through life held hostage by your circumstances.” Then later in the same paragraph she says, “Your hope and happiness is not dependent on the world,” along with a bible passage, “He Who lives in you is greater (mightier) than he who is in the world” (1 John 4:4). The problem with her use of this passage is that 1 John is not talking about a bad day or our happiness, but it is talking about false teachers, which I find to be both interesting and ironic.